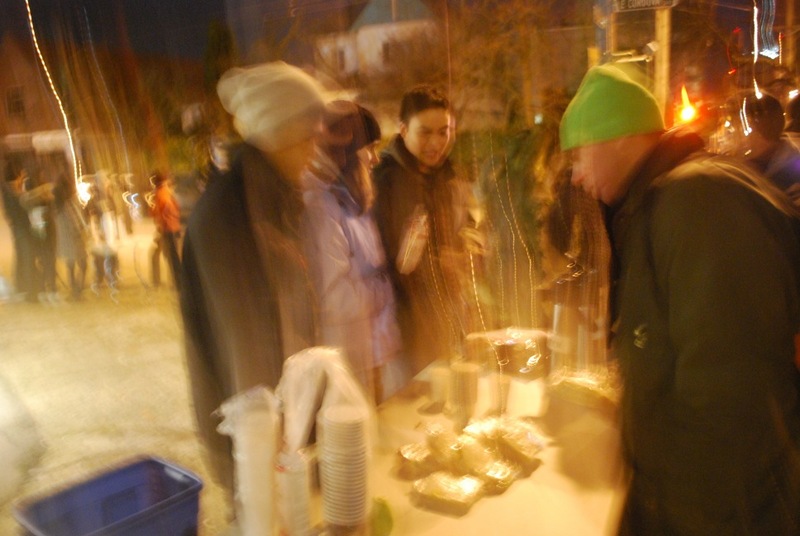 I regularly go with a group of college students at night to the Downtown Eastside (DTES) of Vancouver. That area is sometimes called “Canada’s poorest postal code” on account of its high concentration of hostels and flophouses. Once there, we set up a couple of foldable tables on the sidewalk and give out cups of hot chocolate and bran muffins. During these visits to the DTES, we meet and engage in friendly conversation with a variety of people: homeless, drug-addicts, prostitutes, or residents simply passing by. Some do not want to talk much. Others seem grateful to linger and chat about life. A number of these encounters will remain on our memories for a long time. One of the people we met is Barney. * He told us he was homeless, but survived by hustling and the free meals the various missions provide. Barney stayed talking with us for a while, would disappear, then return again, each time asking for more muffins. Eventually he admitted they were for his friends on the sidewalk around the block, telling us they were crack dealers, and couldn’t leave their spots or they’d lose business. Barney felt that he couldn’t just take food for us without some kind of return, so he decided he would sing us some songs. He broke into the most soulful rendition of “What a Friend I Have in Jesus” I have ever heard. He sang at the top of his lungs and without any self-consciousness. He then asked if we wanted to hear another song, and sang more spirituals that may have been improvised. Although he was “singing for his supper” so to speak, Barney’s simplicity, and the music that issued from him and filled the streets, moved us. I had a keen sense that the Gospel was being proclaimed in the streets of Vancouver that night. Wanda was another guest at "our table". Underdressed on a cold winter night, she accepted a mug of hot coco and a cigarette from one of the students. As they talked, Wanda got more talkative and at ease, and asked if she could bring some extra snacks to her friends in a tenement nearby. We agreed, and despite our remonstrations, she insisted that she would get them to say thanks. Fifteen minutes later we saw some people wrestling with a window on the twelfth floor of the building she had pointed out. Eventually, a pane of glass was forced open and jubilant cries of “thank you very much” echoed across the streets and through the night. The students waved back, shouting “you’re welcome!” It was so ordinary, but somehow it too was a Christian moment. Our last time there, a man wheeled up on a bicycle with a small homemade motor attached. Gus was originally from Newfoundland but had lived on the streets in Vancouver for many years. He would take up odd jobs around the city – loading trucks or fixing things – and could get to places on account of his motorized contraption. Gus was proud of his bike, and all the modifications he had made to it. The cops would harass him about it, he said, but he always told them where to go (sanitized version). A stuffed toy of Bert from Sesame Street rode lashed to the front reflector light, and a row of pliers stood fixed to attention on the handlebar -- just in case. We talked about the bike, his plans to make more engines, the cold weather and other simple things. We bid him farewell and he rode off into the night, feeling warmed, we hope, for having had some friendly conversation. At the same time, we all agree when we go out for coffee and debriefing, that it is Christ who has warmed us. There is no person on earth in whom Christ does not appear.